5 min. walk from Sugimoto-cho Station (JR Hanwa Line). 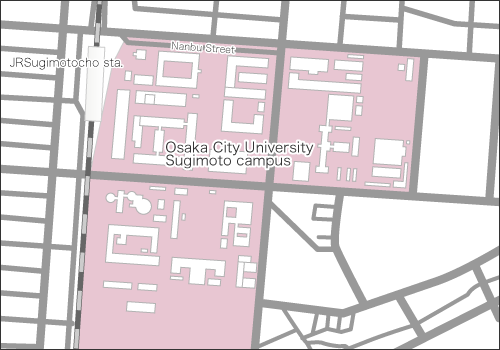 20 min.walk from Abiko Station (Subway Midosuji Line). Take the Kansai-Airport Rapid Service, change at Sakai-shi to a local train for Tennoji and get off at Sugimoto-cho Station. Take the subway Midosuji Line and get off at Abiko Station. Take an Airport Limousine Bus to Abenobashi Station, then take a local train on the JR Hanwa Line from JR Tennoji Station and get off at Sugimoto-cho Station. 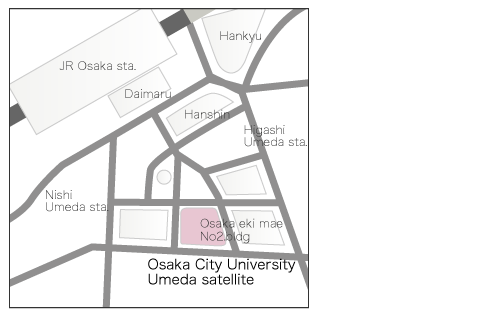 The main campus lies along the Yamato River on the south edge of Osaka, a 5-minute walk from Sugimoto-cho Station on the JR Hanwa Line. 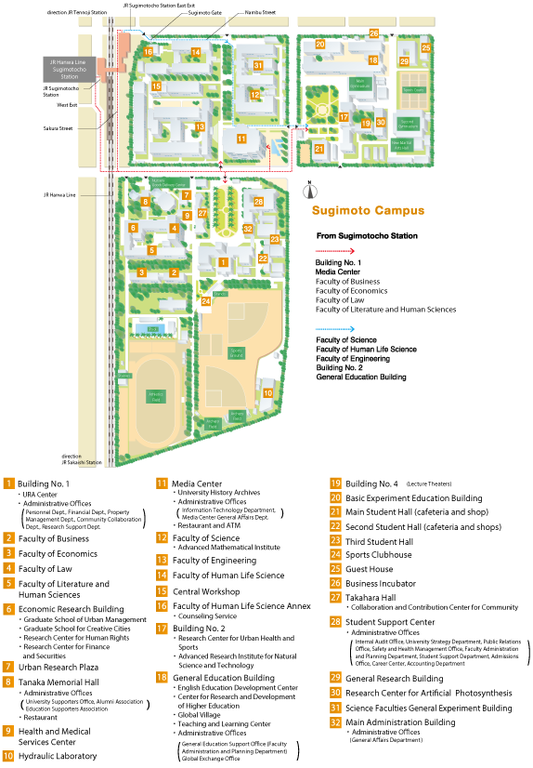 Along with the Media Center and Library, the campus has ample facilities for sports and recreation. 10 min. walk from Tennoji Station (JR Hanwa Line and Subway Midosuji Line). 10 min. walk from Osaka Abenobashi Station (Kintetsu Osaka Line). Take the Kansai-Airport Rapid Service or Haruka Ltd. Express and get off at Tennoji Station. Take the subway Midosuji Line and get off at Tennoji Station. Take an Airport Limousine Bus to Osaka Abenobashi Station. 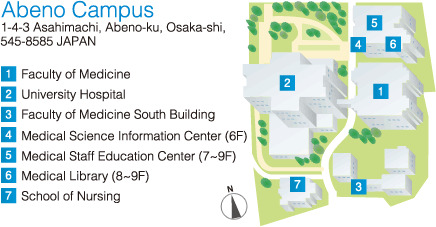 The Abeno campus, site of the university's medical teaching and research facilities, is located west of Tennnoji Station on the JR and Subway Midosuji Lines, and also west of Abenobashi Station on the Kintetsu Osaka Line. 1 min. walk from Kitashinchi station (JR Tozai Line). Umeda station (Hanshin Line), Osaka station (JR Line). 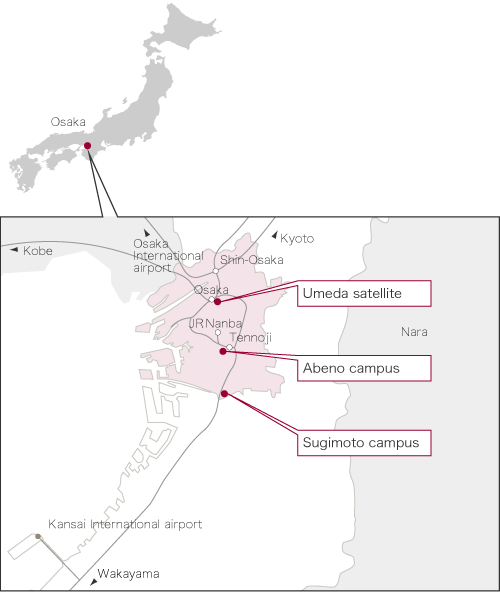 Take the Kansai-Airport Rapid Service for Kyobashi and get off at Osaka Station. Take the subway Midosuji Line and get off at Umeda Station. Take an Airport Limousine Bus to Osaka Station.